Most people have heard that they should keep inventory of the things they own in their home, but very few actually do. And those that do, rarely have one that is kept up-to-date. The good news is that putting together a home inventory isn’t hard. It’s just very time consuming to make a list of everything you own and document what it is worth. However, if anything were to ever happen to your home, you’ll be glad you spent a few hours documenting so you get reimbursed for everything at their worth. Take a few minutes to try to make a list of your belongings without looking around your house. Would you be willing to bet that you can remember everything in the event of a disaster or burglary? Odds are, you’re going to forget a few things and not get reimbursed for them. If anything were to happen to your home or possessions, a home inventory can help you be fairly compensated for your lost items. In most cases, you can just tell the insurance company that you lost certain things, but if they don’t have a specific model number of the item, you’ll be reimbursed for the cheapest version. 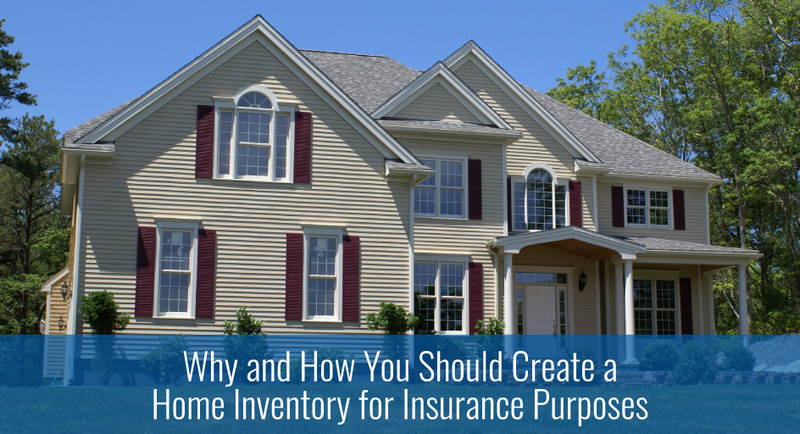 A home inventory can also help you decide how much coverage you need. If you find that you don’t have many expensive items, you wouldn’t need as much coverage as you would if you collected a lot of valuable things. The key to putting together a good inventory of your home is to document thoroughly. It starts with a list. Move from room to room throughout your home to take note of everything you own, including items in your attic, basement, garage, and shed. You can either take pictures of each item, or even better, take video for proof of ownership. While recording the video or taking pictures, just make sure that any serial numbers are visible and that you also record any receipts you still have for the item. If you have a receipt to show proof of purchase, you will often be reimbursed for the amount you paid for the item. Also take advantage of apps such as Sortly that you can download to help make taking inventory a little easier. If you want to avoid such technology, you can create your own system by using a spreadsheet to document the item, description of the item, cost, serial/model number, and anything else you think useful. Whichever method you choose, just make sure you scan your receipts in just so you have a backup. Otherwise, if your house catches on fire or other catastrophe happens, those receipts won’t be there when you need them. It would be unreasonable for you to document literally everything you owned down to your toothbrush. That’s why you should start with your most prized and expensive items. Carefully document items such as TVs, DVD players, cameras, furniture, and jewelry. The best way to do this besides taking pictures is by taking video. Start at one end of the house and video everything of importance in detail (make sure model numbers and any receipts you may have are visible) and do a broad video scan of areas such as your cabinets and closet for a general idea of lower priced items you own. Once you’ve created your home inventory, make sure to update it as you acquire or get rid of items over time. An outdated inventory won’t be very useful to you if you buy several big-priced items right before disaster strikes your home. The most important thing to remember is that once you make your home inventory, make sure that it is stored or backed up somewhere besides your home, preferably somewhere that can never be destroyed. If you have any questions about what is covered under your insurance policy, give your agent a call and they’ll be glad to help you out.